Buddy Bengel ('18), and William McNulty ('15), Team Rubicon Global. This month, the North Carolina coastal town known as the picturesque setting of Nicholas Sparks novels was devastated by disaster. In the aftermath of Hurricane Florence, much of New Bern, North Carolina, and neighboring communities on the east coast were under water. Hundreds have lost their homes and are left stranded without basic necessities like food and water. Presidential Leadership Scholar Buddy Bengel is on the ground leading disaster relief efforts in his hometown of New Bern. “I’ve seen more destruction from flooding [in North Carolina] than I’ve ever seen in my entire life,” said Bengel. Bengel, who is managing director of Bengel Hospitality, has utilized his local restaurants and food truck to help feed over 3,000 people in need including several groups of first responders. Additionally, he’s made plans to receive 5,000 lbs. of donated meals from chefs in New Orleans who wanted to help continue Bengel’s efforts to feed the helpless victims of Hurricane Florence. Knowing the community needed an army of first responders working together, Bengel reached out to fellow Scholar Will McNulty, co-founder of the international disaster relief organization Team Rubicon, and within 48 hours Team Rubicon arrived in New Bern. “He wasn’t even in my cohort, but I was able to reach out and say, ‘I’m a PLS alum and we need Team Rubicon’s help,’” said Bengel. Despite an overwhelming initial response on the ground, Bengel remains concerned about the future of New Bern’s economy and need for housing. To help keep the economy alive, Bengel helped launch The New Bern Relief Fund. 100 percent of the money raised by the fund will go directly back into the community. 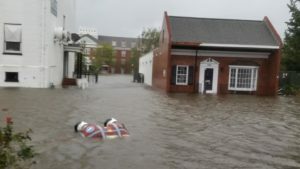 To learn more about how you can help support New Bern and the victims of Hurricane Florence, please visit www.newbernrelieffund.com. Bengel is 1 of 240 Presidential Leadership Scholars, all of whom were accepted into the program because of their passion to positively impact lives through their work, and are now applying lessons learned, from others and each other, to increase that impact. For more information on the Presidential Leadership Scholars program, follow us on Twitter @PLSprogram. A former professional baseball player with business aspirations, Buddy Bengel has gone on to start a number of businesses. Those include a sports consulting firm, a summer collegiate baseball franchise, and most recently, a number of restaurants in North Carolina. With the mindset of creating a new workforce for his restaurants and others, during PLS Bengel focused on getting formerly incarcerated individuals back into the workforce. This initiative has been successful in many of Bengel’s restaurants and has led him to help take this model to the hospitality industry throughout the state of North Carolina. Team Rubicon Global, a non-profit founded by Marine veteran William McNulty, gives skilled veterans around the world the opportunity to continue to serve through disaster response. TRG addresses: the search for new purpose for millions of veterans returning home; the struggle of aid agencies to respond to the increasing severity and frequency of natural disasters; and the global lack of innovative programs for returning veterans. Newly-launched TR United Kingdom responded to the Nepal earthquake. In five years, TRG will build 12 Team Rubicons around the world. Presidential Leadership Scholars helped McNulty better understand how values drive mission which drive strategy & tactics.